I included the Crossed Structure Binding on my list of historical bindings to do; however, I am not sure that it really qualifies as an historical structure. 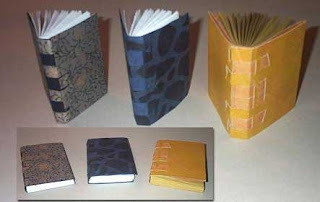 I actually make a lot of these books, using the Crossed Structure Binding Basic (CSB Basic) technique as described by Carmencho Arregui on her website. This structure works really well with a leather cover so it has become one of the styles I use often when making journals (see first pic). Based on the information on Arregui's website, the CSB is her own invention, the idea for which came to her when she was doing her restoration work with historical longstitch bindings. So, the CSB isn't really an historical binding; rather, it is inspired by some historical bindings. Good enough. I will have to explore some of the other techniques she has outlined on her website. The only other technique that I have done is the CSB Solo structure, which works well with a paper cover (see second pic) but not with a leather cover. Arregui suggests that leather could be used if it were pared very thin and also laminated with Japanese paper. But I haven't tried that. Arregui also has details on her website for the CSB Protective, Linked, Expander, Marcopolo, and Hidden models and I have tried none of those. My list of historical bindings to do, has only one more item and that is the girlde book. I have two started and hope to get them finished soon but they are taking longer than a lot of these other bindings. 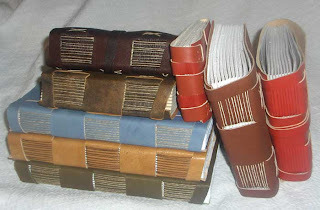 Then I'll have to start on a new list of bookbindings I haven't tried yet, and do some of these other CSBs. Rhonda, I like these very much. I've looked at Arregui's instructions for the Cross Structure Binding, but seeing someone other than him translate them into books is inspirational. Thanks. Thanks bookgirl. I do find the instructions on Arregui's website difficult to follow. The fist time I did one of these was in a workshop with an instructor so that was very helpful! Hey...These are super cute. Do you mind telling me what sizes they all are? Thanks! Hello, I wonder why does a piece of the sections ( white paper) show in all of the backs in pic no 1.? That is just how I made them!